The M-Class offers optional PRE-SAFE Brake, which use forward mounted sensors to warn the driver of a possible collision ahead. If the driver doesn’t react and the system determines a collision is imminent, it automatically applies the brakes at full-force in order to reduce the force of the crash or avoid it altogether. The Q7 doesn't offer collision warning or crash mitigation brakes. An active infrared night vision system optional on the M-Class helps the driver to more easily detect people, animals or other objects in front of the vehicle at night. Using an infrared camera and near-infrared lights to detect heat, the system then displays the image on a monitor in the dashboard. The Q7 doesn’t offer a night vision system. The M-Class’ optional lane departure warning system alerts a temporarily inattentive driver when the vehicle begins to leave its lane and gently nudges the vehicle back towards its lane. The Q7 doesn’t offer a lane departure warning system. The M-Class offers an optional Surround View Camera to allow the driver to see objects all around the vehicle on a screen. The Q7 only offers a rear monitor and front and rear parking sensors that beep or flash a light. That doesn’t help with obstacles to the sides. The M-Class’ driver alert monitor detects an inattentive driver then sounds a warning and suggests a break. According to the NHTSA, drivers who fall asleep cause about 100,000 crashes and 1500 deaths a year. The Q7 doesn’t offer a driver alert monitor. The M-Class has standard mbrace, which uses a global positioning satellite (GPS) receiver and a cellular system to remotely unlock your doors if you lock your keys in, help track down your vehicle if it’s stolen or send emergency personnel to the scene if any airbags deploy. The Q7 doesn’t offer a GPS response system, only a navigation computer with no live response for emergencies, so if you’re involved in an accident and you’re incapacitated help may not come as quickly. Both the M-Class and the Q7 have standard driver and passenger frontal airbags, front side-impact airbags, side-impact head airbags, front and rear seatbelt pretensioners, height-adjustable front shoulder belts, plastic fuel tanks, traction control, electronic stability systems to prevent skidding and available all wheel drive. 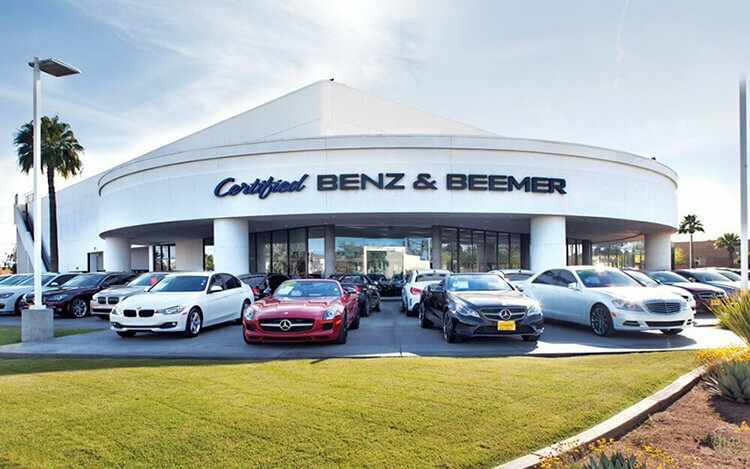 There are over 18 percent more Mercedes dealers than there are Audi dealers, which makes it easier should you ever need service under the M-Class’ warranty. The ML350’s standard 3.5 DOHC V6 produces 22 more horsepower (302 vs. 280) than the Q7 3.0T’s standard 3.0 supercharged V6. The ML550’s standard 4.7 turbo V8 produces 69 more horsepower (402 vs. 333) and 118 lbs.-ft. more torque (443 vs. 325) than the Q7 3.0T S line’s standard 3.0 supercharged V6. The M-Class’ 3.0 turbo V6 diesel produces 49 lbs.-ft. more torque (455 vs. 406) than the Q7’s 3.0 turbo V6 diesel. On the EPA test cycle the ML350 BlueTEC gets better fuel mileage than the Q7 TDI (20 city/28 hwy vs. 19 city/28 hwy). In heavy traffic or at stoplights the ML350 BlueTEC’s engine automatically turns off when the vehicle is stopped, saving fuel and reducing pollution. The engine is automatically restarted when the driver gets ready to move again. (Start/Stop isn’t accounted in present EPA fuel mileage tests.) The Q7 doesn’t offer an automatic engine start/stop system. The M-Class’ standard tires provide better handling because they have a lower 50 series profile (height to width ratio) that provides a stiffer sidewall than the Q7’s standard 55 series tires. For better ride, handling and brake cooling the M-Class has standard 19-inch wheels. Smaller 18-inch wheels are standard on the Q7. The M-Class has standard front and rear gas-charged shocks for better control over choppy roads. The Q7’s suspension doesn’t offer gas-charged shocks. The M-Class has standard front and rear stabilizer bars, which help keep the M-Class flat and controlled during cornering. The Q7’s suspension doesn’t offer a rear stabilizer bar. The M-Class offers active sway bars, which help keep it flat and controlled during cornering, but disconnect at lower speeds to smooth the ride and offer greater off-road suspension articulation. This helps keep the tires glued to the road on-road and off. The Q7 doesn’t offer an active sway bar system. The ML350 4MATIC handles at .85 G’s, while the Q7 3.0 TDI Premium pulls only .83 G’s of cornering force in a Motor Trend skidpad test. The ML350 BlueTEC 4MATIC executes Motor Trend’s “Figure Eight” maneuver 1.4 seconds quicker than the Q7 3.0 TDI Premium (27 seconds @ .65 average G’s vs. 28.4 seconds @ .58 average G’s). For better maneuverability, the M-Class’ turning circle is .7 feet tighter than the Q7’s (38.7 feet vs. 39.4 feet). For greater off-road capability the M-Class Airmatic has a 1.8 inches greater minimum ground clearance than the Q7 air suspension (11.2 vs. 9.4 inches), allowing the M-Class to travel over rougher terrain without being stopped or damaged. The Mercedes M-Class may be more efficient, handle and accelerate better because it weighs about 350 to 450 pounds less than the Audi Q7. The M-Class is 11.2 inches shorter than the Q7, making the M-Class easier to handle, maneuver and park in tight spaces. To almost totally eliminate engine vibration in the passenger area, the M-Class Diesel has an electronically controlled liquid-filled front engine mount and conventional liquid-filled engine mounts (standard liquid front mount on M-Class gas engine). A computer-controlled electric current in the liquid changes its viscosity, allowing the mount to dampen the engine completely at all RPMs. The Q7 uses conventional solid rubber engine mounts. The design of the Mercedes M-Class amounts to more than styling. The M-Class has an aerodynamic coefficient of drag of .35 Cd. That is lower than the Q7 (.37). A more efficient exterior helps keep the interior quieter and helps the M-Class get better fuel mileage. As tested by Car and Driver while under full throttle, the interior of the ML350 BlueTEC 4MATIC is quieter than the Q7 S line Prestige (69 vs. 72 dB). The M-Class has 1.3 inches more rear legroom and .3 inches more rear shoulder room than the Q7. The M-Class has a much larger cargo area with its rear seat up than the Q7 with its rear seat up (38.2 vs. 10.9 cubic feet). The M-Class has a much larger cargo area with its rear seat folded than the Q7 with its rear seat folded (80.3 vs. 72.5 cubic feet). A low lift-over cargo hatch design makes loading and unloading the M-Class easier. The M-Class’ cargo hatch lift-over height is 29 inches, while the Q7’s liftover is 32.9 inches. If the windows are left down on the M-Class the driver can raise them all using the key in the outside lock cylinder or the keyless remote; on a hot day the driver can lower the windows. The driver of the Q7 can’t use the remote to operate the windows. While driving with high beams on, sensitive light sensors available for the M-Class detect other vehicles which could be blinded and automatically switch to low beams. The Q7 doesn’t offer automatic dimming high beams. Optional Mercedes-Benz Apps for the M-Class allows the driver and passengers access to select programs on their smartphones, including finding fuel prices at nearby service stations, searching the internet and other connected activities without taking their eyes off the road or their hands from the wheel. The Q7 doesn’t offer factory integrated smartphone program access. The M-Class offers an optional 115 volt a/c outlet in the cargo area, allowing you to recharge a laptop or run small household appliances without special adapters which can break or get misplaced. The Q7 doesn’t offer a house-current electrical outlet. The M-Class’ optional Active Parking Assist can parallel park or back into a parking spot by itself, with the driver only controlling speed with the brake pedal. The Q7 doesn’t offer an automated parking system. Insurance will cost less for the M-Class owner. The Complete Car Cost Guide estimates that insurance for the M-Class will cost $395 to $4335 less than the Q7 over a five-year period. According to The Car Book by Jack Gillis, the M-Class is less expensive to operate than the Q7 because typical repairs cost much less on the M-Class than the Q7, including $331 less for an alternator, $146 less for front brake pads, $249 less for fuel injection, $1959 less for front struts, $511 less for a timing belt/chain and $86 less for a power steering pump. Consumer Reports® recommends the Mercedes M-Class, based on reliability, safety and performance. The Audi Q7 isn't recommended. The Mercedes M-Class outsold the Audi Q7 by almost three to one during 2013.